Hello, I thought it might be good if we start a thread to explore Bruce Depalma’s N-Machine, and as Peter has worked with Bruce he might be able to share some good information regarding this motor. I was thinking if a homopolar generator requires no motor torque to generate electricity why not add as many as homopolar generators on our motor to take it well above unity? As I have concluded by studying Depalma’s homopolar generator he has discovered that if you rotate a magnet along with the copper disc (i.e attach them together) a current is induced on the disc from center of it to the edge of it. As I was listening to Peters latest interview and he was talking about gravity motors and to take advantage of them to produce mechanical energy. But he also told that he believes in motors which use at lease one more type of energy and that is the FREE centrifugal force! Why not use that in our motors? Elias, I first met Bruce DePalma in November, 1981. A year later, I moved to Santa Barbara, California to study with him. We remained friends until his untimely death in 1997. Bruce’s primary contribution to Physics is the discovery that “INERTIA is not a property of MASS, but a property of SPACE, and SPACE confers its INERTIA on the masses that occupy it.” Bruce’s published evidence in support of this statement is extensive. The simple rotation of an object causes a redistribution of the spacial inertia so that more inertia appears in the plane of rotation and less inertia appears in the axis of rotation. The appearance of “centrifugal force” in the plane of rotation is well known. What isn’t well understood is what gives rise to the appearance of centrifugal force or that its appearance is always accompanied by a drop of inertia along the axis of rotation. Rotation creates the appearance of a spacial di-pole in the inertial frame. When this “zone” of radially polarized inertia is magnetized, electricity can be drawn directly from the fabric of SPACE. The “N” Machine is not a simple technology to understand. Neither is it completely free of mechanical impediments. While it is free of Lenz’ Law counter-torques, it does have another resistance force associated with it that Bruce referred to as DRAG. The machine literally DRAGS against the fabric of SPACE itself. # Overview: We designed this page to disseminate knowledge and accurate data relating to the Pre-Existent Primordial Field of the Universe – a sea of ‘free energy, which permeates all. 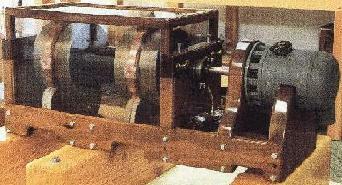 The N-1 Homopolar Generator (pictured above) – invented by Bruce DePalma – is an example of the type of device which is able to “plug in” to this Free Energy and eliminate the “need” for the continued use of fossil fuels and the consequent destruction of our only home – Earth. These devices – and many others like it – have been proven to possess “over-unity” characteristics, i.e. : the power output is more than 100% of the input. It is our hope that in the near future Free Energy will enable mankind to progress from a state of dependence to one of abundance. # About this site: This site is dedicated as a memorial to Bruce Depalma and his work by a friend that knew him. I was fortunate enough to see a demonstration of the “Sunburst built ‘N” machine in Santa Barbara California when Bruce and his team first built it. I am not a scientist or tech type like Bruce was so, I can do little to help disseminate his information other than post his papers for posterity. In the analysis of Free Energy machines it is shown that spatial distortion created to elicit electrical power extraction or anti-gravitational effects, results in the appearance of physical forces in the apparatus. The physical forces which appear represent the tangible counterpoise of the spatial distortion. When a real mechanical object, a flywheel, is rotated, forces appear, the centripetal forces of rotation within the material of the flywheel. These forces are the counterpoise to the spatial distortion created by the centripetal acceleration applied to the mass elements of the rotating wheel. Although these forces are not available for explicit measurement, their presence is evidenced when the wheel is rotated at a high enough speed such that the forces exceed the tensile strength of the flywheel material and an explosion results. The interesting phenomenon is that no work is required to maintain these forces at arbitrarily high values. The gravitational field of the Earth is a spatial distortion occasioned by the presence of mass. The weight of an object is measured by a scale under a condition of constraint, i.e. no motion, and represents the degree of spatial distortion at the point of measurement. Objects in free fall are not acted on by Newtonian forces, consequently their rate of “fall” is subordinated to rate of influx of the gravitational flow. A hydro-electric power station extracts energy from the gravitational energy flow. Gravitational energy is a flow not a force which distinguishes it from Newtonian forces arising from the acceleration of masses. Reasoning by analogy with electrical Free Energy machines within which forces are manifested proportionally as a counterpoise to the degree of spatial distortion required to elicit a certain level of output electrical power, we can hypothesize that to paddle upstream in the gravitational flow a mechanical Free Energy machine would also manifest within itself such a force counterpoise. Thus to generalize we can say that in the class of machines known as Free Energy machines the mode of such apparatus, either in the mechanical or electrical form, is such that the principle of operation is expressible as an equivalence between the explicitly manifested mechanical force counterpoise and the power output of the machine whether it be mechanical, electrical, or other. The gravitational flow represents mechanical power, because power can only be extracted from a flow of power. If the mechanical power output of a machine exceeds the gravitational power flow in the region of its operation then a force will be developed in the direction opposite to the gravitational flow and an anti-gravitational effect will be demonstrated. Actually what is connoted as gravitational power flow and mechanical power output derived from Free Energy anti-gravitational apparatus is Time-Energy. This subject is discussed in other of my writings, reference (1). The archetypal gravitational engine or Free Energy machine is a combination of two counter-rotating gyroscopes with axles parallel and rotors co-planar. The original Force Machine was constructed in 1971, figure (1). The total weight of the apparatus was 276 lbs. The “active” mass at the rim of the flywheels was 10 lbs. The assembly was suspended from a spring scale and the gyroscopes driven counter-rotating at 7600 r.p.m. Under these conditions the support cylinder was driven at 4 r.p.s. to precess the gyros. A consistent set of experiments repeatably showed 4 – 6 lbs. of weight loss. Although thousands of pounds of force were developed, expressed as tension and compression in the walls of the support cylinder, none of this could appear as torque in the precessional axis due to the geometry of the machine. Precession more rapid than 4 r.p.s. caused fracture of the tool steel gyro support axles. It is easy to see how the machine design could be improved by mounting both gyros on the same axle and supporting the developed precessional forces by one rotor bearing directly on the other. Other mechanical improvements would greatly increase the achievable anti-gravitational effect. Figure (2). The important observation is that in a Free Energy anti-gravitational Force Machine, essentially no input mechanical power to the precessional axis is required in the manifestation of arbitrarily large forces in the walls of the gyro support cylinder. From the point of view of physics we can say there is an equivalence between the force explicitly developed in the walls of the machine and the mechanical, time-energy, power produced. Thus in this machine we have in operation a Force – Energy equivalence paradigm of great power. In contrast, the consumptive physics now in vogue can only offer a Work – Energy paradigm expressed in machines which are said to “convert” raw materials into energy. In the construction of an electrical machine analogous to the mechanical Force Machine use is made of the phenomenon of the Faraday disc. It is known that in electrical machines consisting of a conducting disc rotated proximate and co-axial to the magnetic pole of an axially suspended magnet, figure (3), no reaction torques are transmitted from the driven or driving disc to the magnet supplying the exciting field. Attachment of the conducting disc to the magnet itself and co-rotation of disc and magnet elicit an electrical potential between the center and outer edge of the conducting disc. Electrical power at a high degree of efficiency exceeding the electro-mechanical equivalent of work may be drawn from this apparatus, (N-machine). When the N-machine was originally disclosed to the public, ref. (2), (3), careful testing revealed output electrical power exceeding equivalent input mechanical power by 5 – 7.7:1. Theoretical considerations derived from experiments with the mechanical Force Machine would lead one to expect that power could be extracted from such a machine almost free, i.e. electrical power could be extracted without any drag being reflected on the source of driving energy. Many other experimenters attempted to “improve” on the original design. In most cases however while overall efficiency was greater than unity it rarely exceeded 2:1. What was forgotten was the withdrawal of electrical energy in itself created a spatial distortion which interfered with the action of the machine by creating drag. The high efficiency of the “Sunburst” prototype was due to partial compensation of field distortion created by current withdrawal. With reference to figure (4), the magnetic field created in the rotating current collecting disc was partially cancelled by current flow in the opposite direction in a fixed conducting plate, situated as close to the rotating disc as the thickness of the brush assembly would allow. Indicated schematically in the drawing. An improved machine would position a fixed compensation plate as close to the rotating disc as physically possible. Thus current withdrawal would cause the minimum distortion of the exciting magnetic field. In this case almost totally free power would be obtained. The double machine of figure (5) shows an almost ideal configuration where compensation for the spatial distortion of current withdrawal as well as doubling of voltage output is accomplished by contra-rotating magnetized rotors supported on a single shaft. There is a striking similarity between this construction of an N machine space power generator and the suggested twin counter-rotating gyroscopes mounted on a single shaft as an anti-gravitational mechanical space power generator. It is suggested that a mechanical space power generator is converted into an electrical space power generator simply by magnetization of the gyroscopic rotators. In terms of the Force – Energy paradigm the constrained repulsive force generated between the contra-rotating magnets upon the withdrawal of current represents a measure of the electrical power output of the machine. In the anti-gravitational space power machine the torques created in the precession of the counter-rotating gyroscopes, absorbed one upon the other are representative of the anti-gravitational effect. On the basis of the geometry of both the electrical and mechanical force machines there should be no drag or resistance to precession of the counter-rotating gyroscopes or contra-rotation of the magnetic rotors. Force – Energy equivalence relates to the relationship of internally generated constrained forces and space power output. What we would call efficiency would relate to the work input to these machines, i.e. torque x angular velocity compared with the space power output. Space power is developed out of distortion of the normally isotropic space, the amount of distortion being represented by the reflected internally constrained forces explicitly developed in these machines. As yet there is no measure of space power expressed mechanically as an anti-gravitational effect. Electrically developed space power can be measured in watts. Consequently the efficiency of an electrical space power generator can be expressed as electrical watts output divided by the electrical equivalent of mechanical power required to rotate the magnets. On the basis of present understandings of electrical and mechanical forces, the geometries of both the mechanical and electrical space power machines allow of none of the internally constrained forces developed to appear in the drive axis. Consequently space power should be developed as totally free mechanical or electrical energy. Measurements on practical machines however do show drag to be present. Because one torque is neutralized by an equal and opposite mechanical torque or a force of electrical repulsion is constrained by an equal and opposite mechanical force does not mean that the space in which the neutralization occurs is returned to its original state of isotropicity. I have given a great deal of consideration to this situation. In the conservative physics of the work-energy paradigm the thermodynamic law of Equi-partition of energy gives some insight of the energy coupling of orthogonal modes of mechanically interpreted systems. In the physics of energies elicited through spatial distortion of the cosmic primordial field a useful idea is the concept of Defect of Forces which can help us understand the properties of situations whose neutrality is achieved by the balancing of equal and opposing similarly derived forces. The idea is that when a force is manifested as a counterpoise to an experimentally created spatial distortion, i.e. the forces existing in the body of a rotating flywheel, mutually constrained precessional torques or the balancing of electromagnetic distortions by the superposition of equal and opposite vector fields; the manifested force is not perfect. A perfect force by definition possesses only magnitude and direction. A real force manifested as a counterpoise to a condition of spatial distortion has a magnitude, a direction, and something else. The something else would be a property of imperfection common to the universal manifestation of what we know as Reality. The philosophical treatment of the innate imperfection of Reality is beyond the scope of this paper. Suffice it to say, in a physical sense, the defect of forces is a real entity and is the property held in common by all manifested forces, and represents a possible mode of coupling between them. For example an explanation for the phenomena of inertia can be developed out of the coupling of atomic and nuclear forces to the balance of the mass in the Universe through the mechanism of defect of forces. The defect of forces exists, yet is unquantifiable except in terms of itself and has no known properties in terms of things that exist. Its existence is non-existence yet it is held in common with all things that exist. I posit that defect is connected and is responsible for the phenomenon of inertia. In terms of this paper I posit the drag which appears in the drive axis of orthogonal machines is a coupling of the force counterpoise of the created spatial distortion into the drive axis through the mechanism of connectivity of defect. Force – Energy equivalence is a simple expression that in what I call orthogonal machines a force is manifested proportional to the degree of created spatial distortion. The primordial cosmic field is pure energy, consequently distorting it to obtain a polarization from which power is drawn can make available an arbitrarily large quantity of energy. The energy available is limited more by the mechanism of extraction than the cosmic field. The idea of efficiency applies to the particular configuration of mechanically realizable extraction apparatus. Force – Energy is a way of characterization of the degree of spatial distortion achievable with mechanical apparatus. Defect of forces is a concept to explain why free energy machines are not infinitely efficient. It is also proposed as a mechanism to explain the phenomena of inertia. The machines we construct are almost infinitely puny in comparison to the energy released from the cosmic field observed in the super-nova. The ideas of spatial distortion, Force – Energy equivalence, and defect of forces may open our eyes somewhat to the latent and omnipresent power and majesty of the universe. It is constructive to consider the interpretation of familiar phenomena from the viewpoint of Free Energy. Distortion of the cosmic energy field by the presence of mass evokes the gravitational flow of time energy. The measure of the created spatial distortion is the force counterpoise known as weight. Distortion of the primordial field by a rotating flywheel or gyroscope evokes the od field of inertial anisotropy. In this case the force counterpoise is not explicitly available but nonetheless exists centripetally expressed within the body of the rotating object. In the interpretation of stellar phenomena the gravitational flow into matter could result in the liberation of heat. Denser matter would increase in temperature. The liberation of energy in stars could result simply because of their mass. As stars became more dense because of gravitational accretion of mass more energy would be liberated. Under gravitational pressure matter itself might have various stages of collapse. The first stage of collapse could precipitate from the cosmic field energy sufficient to cause a Nova. A second state of collapse could precipitate a Super-Nova. A normal stable star would operate in a density range where matter would retain its identity in terms of the series of known elemental configurations. The collapsed matter stages of the nova or super-nova can only be hypothesized and probably would not be available for study under terrestrial conditions. The important observation is that the explosion of a star is analogous to the explosion of a flywheel when rotated at sufficient speed such that its internal cohesion is neutralized by a superabundance of time energy precipitated from the cosmic field. In this case the invocation is rotation. For stars the invocation is mass density and the perceived effect is the gravitational flow. What the rotating flywheel and the star have in common is that an explosion can occur when the internal energy exceeds the forces of material cohesion. A long and useful life results when the density of energy invoked from the cosmic field is less than that required for the disruption of the elemental materials from which they are constructed. – 1) DePalma, “On the Nature of Electrical Induction”, 28 July 1993, Nova Astronautica, vol. 14, number 59, 1994; Magnets, vol. 7, number 8, August 1993; New Energy News, vol. 1, number 6, October 1993. – 2) DePalma, N-machine D.C. Generator, 24 March 1978, drawing available from B. E. DePalma, Private Bag 11, Papakura, South Auckland, New Zealand. – 3) Kincheloe, Homopolar “Free Energy” Generator Test, presented at 1986 meeting of the Society for Scientific Exploration, San Francisco, CA, U.S.A., 21 June 1986, revised 1 February 1987. Contains references to earlier DePalma papers re N-machine. Law of Equipartition of Energy: In a given thermodynamic system, the total energy will subdivide itself equally amongst the characteristic modes of the system. After Michael Faraday performed the initial experiments resulting in the discovery of the one-piece homopolar generator of December 26, 1831, figure (1), he devoted considerable effort to reconcile the appearance of generated electrical potential in the apparatus with his conceptualization of the cutting of flux linkages by a moving conductor. Although Faraday never adduced an experiment to prove the cutting of flux linkages in the axially rotating magnet experiment, he was troubled to his last days about his interpretation of his experiment. It took until 1978 when DePalma, reference (1), did the critical experiment to determine if the form of electrical induction was the same as the flux cutting originally proposed by Faraday. The problem has been re-stated by other workers who would attempt to determine whether flux lines rotate with, or are spatially independent of the axially rotating magnet. To date, no experiment has been found either to confirm or disprove the axially rotating flux line hypothesis, reference (2). The laudable efforts of Clerk-Maxwell to express in mathematical form the results of the electrical experimentation of Faraday reflect the uncertainty which he had over the interpretation of the 1831 experiment. The result was that Maxwell did not consider the problem at all, or felt he had nothing more to offer. For those scientists who consider mathematical expressions of physical laws as the only possible descriptions of physical reality, having no mathematical description is tantamount to no physical reality. Electrical science, which is considered to be completely known, has been ultimately reduced to a completely self-consistent set of equations which are suitably stored in computer memories and are used to design motors, generators, transformers and other sorts of familiar electrical hardware. The first place electrical science went wrong is when electrical phenomena which were not subject to unambiguous mathematical interpretation were simply omitted from electrical curricula. The second place electrical science went wrong is concisely illustrated in a sequence of evolution of electrical machinery abstracted from “Exciting Electrical Machines”, by E. R. Laithwaite, D.Sc., Ph.D., C.Eng., F.I.E.E., F.I.E.E.E. Professor of Heavy Electrical Engineering, Imperial Technical College, London, England. Reference (3). “The various steps shown in figure [3 (a)-(d)] do not represent an historical sequence. They represent an attempt to break down the topological difference between Faraday’s disc and an early type of commercial machine into simple basic steps. Figure [ 2 ] shows a cross section through the disc machine. In theory the two brushes marked (+) would be part of a continuous annular brush at the centre; likewise the (-) brush extends all around the periphery. This arrangement is represented diagrammatically in figure 3(a). The first step consists of elongating the disc axially so that it forms a cylinder. The magnetic circuit is then re-arranged so that the flux enters the rotor through one end of the cylinder and emerges through the periphery, as shown in figure 3(b). If the rotor were of solid copper, the magnetic circuit through it would be poor. The rotor is therefore modified to consist of a hollow cylinder filled with iron, as shown in cross-section in figure 3(c). For ease of mounting the rotor, i.e. with a bearing at each end, the iron core is made integral with the conducting cylinder and the two rotate as one unit. In a manner so casual so as to escape attention Laithwaite alters the magnetic field direction from flux lines parallel to the axis of rotation to flux lines perpendicular to the rotational axis. This fundamental change and the unstated ambiguity: do flux lines rotated in the manner shown, figure 3(e) ipso facto demand a two-piece machine, figure 3(f)? If the two piece, i.e. rotor-stator construction is implicit for electrical machines where the flux lines through the rotor are perpendicular to the axis of rotation, then what has this to do with the archetypal one-piece Faraday homopolar machine which does not require a stator. Is the evolution suggested by Laithwaite an evolution or the description of two fundamentally different families of electrical machines? In his dissertation Dr. Laithwaite has made a number of assumptions, which, in the light of contemporary knowledge, can be questioned. I am not singling out Dr. Laithwaite as being defective in his reasoning, but his position of authority is representative of the presently accepted level of knowledge of electrical science. – The first assumption:That there is a relationship between the Faraday disc and the two piece induction machine of commerce. – The second assumption: That there is no difference in behavior of electrical machines if the source of flux moves with the rotor or not. – The third assumption: That there is no difference in the behavior of electrical machines if the flux lines are either parallel or perpendicular to the axis of rotation of the machine. – The fourth assumption:Flux cutting is the only mechanism for the generation of electricity from magnetism. It is left to the reader to intellectually explore the implications of the first three assumptions on the evolution suggested in figures 3(a)-(g). That the fourth assumption is suspect is ably illustrated by a second extract from Laithwaite. “Figure [4(a)] shows that surface conductors demand a gap in the magnetic circuit which must increase with increase in thickness of conductors, which in turn is demanded by an increased current loading, whereas a conductor system in slots as in figure 4(b) can combine thick conductors and small airgap in one arrangement. Quite apart from magnetic considerations, conductors on the surface are liable to become displaced around the periphery, aided by the speed of rotation which tends to stretch and loosen the conductors. If the conductors are constrained in a slot, and held in by a non-metallic slot wedge as shown in figure , the speed of the machine, and therefore its output, can be increased without suffering these effects of rotation. It is not all of us who conceal our ignorance by appeal to the belief in the “magic” of electromagnetism. The fact that the modern two piece wound rotor machine works at all speaks to the operation of electrical laws outside the computer controlled algorithms now representative of electrical science. – The fifth assumption:The fifth assumption is that all the laws of electrical science must be consistent with the energy conservation laws. Is this why the “magic” of electromagnetism is necessary? – Reference (1): Magnetism as a Distortion of a Pre-Existent Primordial Energy Field and the Possibility of Extraction of Electrical Energy Directly from Space, Bruce DePalma; proceedings of the 26th annual Intersociety Energy Conversion Engineering Conference (IECEC), Boston, Massachusetts, August 4-9, 1991. – Reference (2): “Spinning Magnetic Fields”, Djuric; Journal of Applied Physics, vol. 46, no. 2, February 1975, pp. 679-688. – Reference (3): Exciting Electrical Machines, E. R. Laithwaite, pp. 13-17; Pergamon Press Ltd., Oxford, England, 1974. # Summary: The theoretical prediction and experimental elucidation of the variable ratio of inertial to gravitational mass of a constrained gyroscope under forced precession opens up a new field of Inertial Mechanics. The controllability of inertial mass makes possible the generation of thrust by mechanical motion alone. A new device, the Linear Force Machine, is described which operates on a heretofore unrecognised interaction between rotation, magnetism, and inertia, to generate a unidirectional force as a solid state interaction. The application of a controlled and directed mass field flow to the containment of a controlled thermonuclear power reaction is discussed. # Introduction: The mechanical generation of a unidirectional force, is shown to be a consequence of the variable inertia property of matter. # The Linear Force Machine: A series of experiments1, has elucidated a variability in the ratio of inertial to gravitational mass of real objects. The key to the unsuspected variability of inertia of real material object lies in heretofore unrecognised properties of rotation. The possibility of inertial control makes practical the generation of a unidirectional force through purely mechanical interactions. For the simple spherical metallic object, the spinning ball, the od number may reach factors of five or so as the rotational speed is increased to the point where the object will explode, i.e. 50,000 rpm for a 1 inch steel ball bearing. For practical controllability of inertia, larger inertial variations must be created and be subject to control other than the rotational acceleration of a test object to 50,000 rpm and then back to zero again as part of a cycle. A suitable mechanism for the demonstration of the unidirectional force is a mechanical arrangement based on the force machine. A force machine, c.f. figure (1), is a combination of two mechanically identical gyroscopes, rotating coplanar and with parallel axes, in opposite directions at equal angular velocities. Such a device allows us to study the properties of rotation without interference from gyroscopic torques. Since inertia is isotropic, it is clear that inertial changes engendered from procession are reflected in linear inertial changes as well. A sequence of operation is indicated. Consider the energized (gyros turning) force machine. The machine is pushed away from the experimenter in the low inertia (no precession) condition. When the machine is pulled back, however, the gyros are precessed at some angular velocity Omega. The condition of precession multiplies the inertia of the rotating gyroscopes by a factor of several hundred times. This is reflected linearly and presents a strong resistance to the force exerted by the experimenter attempting to return the machine to its original, (near) position. A phase diagram showing the relationship of the linear velocity to torsional oscillation and the direction of net momentum flow, appears in figure (2). A combination of mechanical linkages to accomplish this effect in a rapid cyclic manner is shown in figure (3). The resultant momentum flow is a product of Nod (precessional) f(t) and v(t) (linear motion), and represents the unidirectional reaction force. The machine of figure (3) has been constructed in our laboratory and delivers unidirectional reaction force in the pulsating manner expected. The device is called a Linear Force Machine. # Inertial Mechanics: The field of inertial mechanics refers to that class of mechanical experiments wherein inertia becomes a variable. 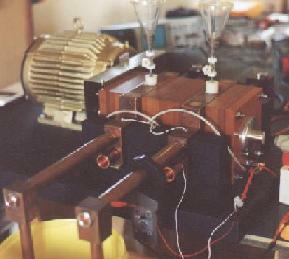 Although the mechanical force machine demonstrates the usefulness of the variable inertia concept in the generation of a unidirectional force; there are several reasons why such a machine stands in relation to its ultimate form in the same wise as the early rotating mechanical radio frequency generators stand in relation to the modern high power vacuum tube or transistor radio frequency power oscillators. In the first place the delivery of force or momentum impulses is in a pulsating manner. It would be highly desirable to have the delivery of force or momentum in a steady manner. Secondly, the necessity of maintaining the condition of energization of the force machine requires a steady high speed rotation of constrained gyroscopes. As well as the necessity for the supplying of the rotational excitation via electric motors or mechanical gearing, the necessity for sturdy bearings to support the gyros under intermittent reciprocating precessional torque reactions. The fact that these are problems of a conventional sort, which can be easily solved through accessible bearing technology, does not mitigate against the search for a more desirable rotational-inertial interaction. In the linear force machine thus far described, the form of the motion imparted to the force machine, is called “three dimensional”. The form of motion where driven precession is coupled with linear oscillation is called “streptation”, a derivative of the Greek word for twisting. What is desired is a mode whereby streptoid motion can be achieved without mechanical linkages and reciprocation. Such a machine would achieve the generation of unidirectional force without pulsation. # Inertial Drive: The ideal inertial drive would achieve a smooth flow of momentum in a desired direction with the resultant reaction force of steady and constant magnitude. The method of accomplishing this result is through a heretofore unrecognized magnetic interaction. With reference to figure (4) we observe a rod of medium hard magnetic material suspended within the gap of a permanent magnet. The length to diameter ratio of the magnetic core determines the dimensions of the magnetic gap. From the front to rear of the machine the magnetic gap is twisted 180 degrees. The magnetic core is suspended on bearings designed to withstand whatever thrusts are generated by the machine. Within the gap of the permanent magnet the magnetic induction is maintained such that the magnetic core is saturated under all conditions of operation of the machine. Under such conditions the external magnetic field maintains alignment of the magnetic dipoles within the material such that no projections of internally generated torque vectors, produced by rotation of the magnetic core within the gap, can appear in the drive axis. This is the familiar disappearance of hysteresis torques under saturation conditions, and represents the condition of constraint of a rotating gyroscope. Motion of a magnetic material in a magnetic field sufficient to cause saturation elicits the identical inertial properties that have been found in rotating real mechanical objects. What is necessary is to obtain the streptoid three dimensional motion in order to elicit the unidirectional force. This is simply accomplished by twisting the magnetic gap so that in rotation the magnetic dipoles within the core material are both twisted and translated. The combination of twisting and unidirectional translation is simply accomplished by rotating the magnetic core. In like manner to the precession torques of rotating gyroscopes, the hardness of the magnetic core material will determine the strength of the interaction. The ultimate force handling capacity of the machine will be limited by the demagnetization of the rotating core through inability of the external field to maintain constraint over the magnetic dipole interaction. The machine of figure (4) becomes a fundamental drive unit, capable of generating a thrust against “space” itself, and thus may replace all earlier methods of generating unidirectional motion, i.e. gears wheels transmission units for road travel, and propellers and jets for airborne vehicles. # The Mass Field Effect: The ability to enhance the inertia of a rotating object controllably makes for the possibility of controlling the flow of inertia. The mass field or OD field represents the possibility of storing energy in the inertial property of space. That this has been shown as a field which exists is the result of our prior experiments. Now the possibility of a directional flow of that inertia, the mass field, exists as a concomitant of the operation of the linear force machine. A directed mass field flow can have useful mechanical applications. # The Hydrogen Fusion Reaction: Although it is cloaked in many mysterious terms relating to the properties of nuclear plasmas, the fusion of hydrogen to helium is nothing more than another form of burning or combustion which can only take place under conditions found in the interior of stars. Creation of such a condition here on Earth entails the creation of a region of space, a “bottle”, wherein the proper temperature and conditions for such a reaction are maintained. At a temperature of l09 degrees K, the necessary conditions can be maintained only through a field of force. Prior attempts to contain the reaction through electric and magnetic interactions with the charged plasma have failed through the inability to generate sufficient forces for containment. Although at present, it is just an experimental possibility, it is suggestive to consider a containment region maintained through the mass field flow of a suitable number of linear force machines arranged geometrically with their force vectors convergent to delimit the reaction region. # Mass Field Flow: When an OD or mass field is created, its first order effect is to enhance the inertia of material objects immersed within the active region. Momentum can also be transmitted through a mass field, and this is responsible for the conundrum of a “mass field flow”. In general we associate a flow with the movement of material. The flow of momentum associated with the mass field of a linear force machine, is, a directed flow of inertia which acts to produce a linear force on mass particles immersed within the field. The resulting flow which takes place, is described by the motion of test mass particles. Thus, although the mass field does not itself flow, test particles immersed within it are acted or by forces which cause motions similar to those of the fluid flow in liquid and gasses. On the basis of this analogy we can see how a region of containment can be created by the geometrically symmetrical and radially inward convergence of directed mass field flow. In many respects the magnetic core of a linear force machine resembles an antenna whose directivity is a function of the length to diameter ratio of the rotating member. If this relationship holds true, it is suggestive to consider the degree of focusability of these beams and the attractive and repulsive forces which may be set up in a properly directed array. The potentialities of these arrangements need to be explored in every possible detail in view of the possible vital payoff in terms of the controlled fusion reaction. Other possibilities of controlled and directed mass field flow are left to the imagination of the observer. # Conclusion: The linear force machine, as a mechanical prime mover, replaces gear trains, propellers and jets, as a device for the generation of thrust with one moving part, and the polarity of thrust determined by the sense of input shaft rotation, this machine becomes a fundamental tool of our civilization. In degree of sophistication, this machine represents the level of scientific inquiry of our society. The forces which use and make ready this device for the benefit of society, will have at their disposal a tool of unprecedented force and power. The use of this machine to enable the controlled thermonuclear fusion reaction will inaugurate a new dawn of civilized society on this planet, and will inaugurate the entrance of Man into interplanetary space and ultimately the stars. Acknowledgement is given to Mr. John S. Wolf, (formerly of) 741 Torrington Place, Dayton, Ohio 45406, for the independent development of the theory of the relationship of inertial to gravitational mass of a precessing gyroscope, and to whom the terms “mass field effect” and “streptation”, are credited. Mr. Wolf is one of the pioneer investigators in this new field of inertial mechanics. # Introduction: For the last four years this investigator has been engaged in the theoretical and experimental development of a new conception of physical Reality. The basis of the conception resides in the variability of inertia which may be engendered through the rotation of real physical objects. These experiments are summarized in the body of this report. At the point where the possibility of a practical antigravity machine had been practically realized an attempt was made to correlate the physical characteristics of this – force machine – with the observed phenomena in common with the UFO flying saucer encounters and sightings. A positive correlation was made with the characteristics of our force machine and the artifacts of the antigravity-propulsion principle of the UFOs. A thorough examination of the available data has led me to conclude the UFO phenomena are real and represent a true incursion of a parasitic extraterrestrial race onto this planet. This paper serves as a warning and a call to action in the repulsion and annihilation of these invaders. # New Physical Information:What is important is my experiments place me at the carbon filament electric light bulb stage whereas our enemy possesses the modern electro-luminescent panel solid state variety. We are all familiar with the great experiment of Galileo in 1590 when he showed that objects of different weights fell at the same rate when he dropped them from the top of the Leaning Tower of Pisa. This experiment has been formulated as a principle by later thinkers. The Einstein principle of equivalence is the contemporary expression of the idea that the acceleration of gravity is the same for all objects, and, for this a construction is possible which represents gravity as a property of a geometrical interpretation of space. This is the current “standard interpretation.” Of course if a situation were found wherein the rate of gravitationally induced acceleration could be varied, constructions and theories based on the original Galilean experiment would be rendered void. As well, control of the rate of fall of objects is the entré into the construction of a practical mechanical antigravity machine which could be ultimately developed……. – 1) Rotating objects falling in a gravitational field are accelerated at a rate greater than “G”, the commonly accepted rate for non-rotating objects falling in a vacuum. – 2) Pendula utilizing bob weights which are rotating, swing nonsinusoidally with periods increased over those of pendula with non-rotating bobs. – 3) A precessing gyroscope has an anomalous inertial mass, greater than its gravitational mass. – 4) An anomalous field phenomenon has been discovered, the OD field, which confers inertia on objects immersed within it. This field is generated by the constrained forced precession of a rotating gyroscope. These simple experiments which can be verified by any experimenter with simple equipment, form the basis of a new interpretation of physical Reality. As well as being the most fundamental physical discoveries since the experiments of Galileo, to mathematics must be added a new fundamental proposition, such that the phenomena be described. This proposition may be stated: No numerical quantity, representative of a physical measurement, may be infinitely subdivided. For example, a contemporary mathematician would claim that the center of a rotating disc was not rotating. This is false to fact. At the other end of the spectrum this paradox is represented by the topological fixed point theorem of Euler and the aleph null and aleph one transfinite denumerable non-denumerable paradoxes of Georg Cantor. The limitation of the Newtonian laws of motion to the special case of non-rotating objects, (and other limitations as to the rate of change of acceleration), places our present level of physical understanding on the threshold of the resolution of these paradoxes and the generalization of our conception of motion. The spinning ball experiment which shows a greater rate of fall than a non-spinning object is the stone of David which slays the Goliath of the ideational constipation which clouds the best minds of our race. It is not germane to the purpose of this paper to engage in further exposition of these ideas. Spontaneous interest must be sparked by the individual verification of these ideas by the motivated investigator. For the present it is sufficient to say that a much greater theoretical and experimental context now exists into which these primary results fit. With the variability of inertia established, and the interaction of a rotating object with the gravitational field, several kinds of antigravity machines may be constructed. Without going into constructional details here, the machines take two forms. The first kind involves the generation of an OD field of sufficient strength to neutralize the gravitational attraction of the mass of the machine itself and associated masses. The second form of the machine – the linear force machine – is a direct conversion of rotational energy input to a unidirectional force output through the principle of variable inertia. Details of this machinery are available from this source. The generation of a force (OD) field of sufficient strength to propel a space vehicle results in a local interaction with the electromagnetic field which may be characterized as an increase in the inertia or slowing down of electrical processes, viz., for instance the magnetic field collapse which is necessary for the generation of the spark ignition voltage in a gasoline engine is slowed down to the point where insufficient voltage is generated for ignition and the engine stops. An alteration in the resonance of electrical circuits to lower frequency and a cross modulation of frequencies of different signals existing within the same circuit. A similar mechanism causing the anomalous red shift of optical signals is observed in the Quasar stellar phenomena. That such a mechanism exists in a stellar phenomena together with the observed UFO behavior strongly indicates the generation of an OD field is possible through a solid state interaction. A proposal has been developed along these lines on the basis of an interaction between rotation, magnetism, and inertia. It must be emphasized that when inertia is no longer considered a constant, variations in inertia as the result of certain physical processes can be searched out and applied to the solution of a number of important physical problems. As well the effect of a field which confers inertia on objects immersed within it can be applied to a number of situations, not all of which have to be mechanical, i.e. chemical reactions are affected by such a field. Reactions which do not take place under “normal” conditions may be catalyzed. Other reactions may be inhibited. There is a strong effect on the operation of the human nervous system of such a field. It may be used to inhibit behavior. # An Analysis of the UFO Situation: Clearly the observed UFO behavior both with regard to the mechanism of propulsion and the inhibitions which have been directed against humans and internal combustion engined machinery and radio apparatus suggest strongly that here is an extraterrestrial group which uses the OD field as the basis of their energy generation, propulsion, and communication. The use of directed od fields together with intense stroboscopic illumination to dazzle and confuse native populations appears to be the standard operating procedure for the “outsider” operations on this planet. I would like to point out that for myself, as a physical investigator, I was unable to reward the plethora of sightings and encounter information with appropriate credibility until I was able to generate the propulsion field within my own laboratory and gauge some of its characteristics. At this point it became possible to separate hard data information from concealment and subterfuge deliberately generated to confuse and obfuscate the human population. I might add that their effort is immeasurably aided by our inability to decide whether they are here at all. An inability which is nurtured by the egos of those individuals who continually demand more “proof” in the face of an overwhelming amount of evidence which is being gathered by concerned individuals of much less “sophistication” than the “experts” who are to be “convinced”. A list of such “experts” is appended to this report. They should be avoided or bypassed by anyone who would seriously get behind the world-wide action activity which is necessary to rid our planet of these parasites. On the basis of the known UFO information and the results of my laboratory experiments, I have been lead to the following hypothesis: It seems to me that to consider space unpopulated by any others than the inhabitants of this planet is a modern form of geocentrism. Quite the contrary I believe space to be inhabited by the members of many races who probably live in a loose confederacy. We should not be deluded by those thinkers who are tied to an Einsteinian space time manifold who believe space travel is impossible. My work has shown that present conceptions of space and time are now to be revised in the light of the refutation of the theories of Einstein. If we conceive space to be populated then we can also conceive that the races which have attained space travel would view with benevolent eyes the activities of younger races whose youth and vitality was about to carry them over into the discovery of the variability of inertia and the perfection of a means of propulsion by pushing against space itself. If I were observing from outside, so to speak, I would see it was necessary to relinquish certain limitations of thought, i.e. the “velocity of light”, the invariance of inertia, before a more properly general attitude could be developed such that new machinery could be designed and built. In this state of potentiality I would see that to interfere with the development of this race would be to damage the natural mental growth process leading to the entrance of man into space as an equal, or on an equal developmental footing to the races which were already there. There already may be in existence a police force for the protection of undeveloped planets from the ravages and incursions of exploiters and predators, especially where intelligent races were involved. I am sure that when the United States enters space it would constitute itself as the protector of the weak as the fundamental consequence of the democratic system of government. At least it is clear that if less altruistic motives were involved, contacts would not be made in a clandestine and surreptitious manner. The evidence suggests the Earth has already been invaded by a small group of parasitic outsiders. Such a group would probably live its whole existence in spaceships preying upon undeveloped and primitive worlds for the procurement of natural products which could not be generated in a space environment. It seems to me that no race which had a home planet would operate surreptitiously on another world. Even though these outsiders possess (at present) superior technical knowledge, their small numbers do not permit them to dominate this world. If such an attempt were to be made, all the technological resources of the planet would be mobilized against them and such an operation would certainly be apprehended by other more mature members of the interstellar community. It serves the interests of these parasites to contemptuously remove from our society whatever it is that interests them. It seems to me that the removal or mining of physical resources or goods would be immediate1y noticed. The one quantity whose disappearance would not be noticed is people. This datum fits in nicely with the disappearances in the Bermuda Triangle and the complete control the outsiders have had over those individuals who have been simply “examined” and then released. Perhaps certain desired characteristics were lacking in the individuals who were apprehended and then released. A parasitic race living in a space environment would be continually irradiated with hard radiation from outer space. The most chilling hypothesis is that this humanoid species is praying upon us for certain blood fractions necessary for life in a high radiation environment. Reproduction would also be affected. What attempts might be made in conjunction with this species can only be guessed at. The facts are that the released individuals can have memories of their experience recovered through deep hypnotic treatments. Certainly it is within the capabilities of human medical technology to perform operations such that the subjects concerned have no memories of the procedure. The fact that the erasure is incomplete in cases of the recorded UFO human encounters bespeaks of the contempt of a group which holds itself to be superior to its host. The fact that no whole-scale invasion has taken place, with overt contact made, speaks to me of a fundamental Achilles heel to the operations of “outsiders” on our planet. The fact that Earth is our home planet, and that large scale depredations would be observed by other intelligent forces, places the human race in a fundamentally superior position no matter how far advanced the technology of this interloper group is. The capitalization of this position for the defense of our planet and the repulsion of the UFO outsiders depends upon our ability to 1) intercept the UFO communications, 2) construct weaponry effective against UFO vehicles, and, 3) construct vehicles propelled by variable inertia machinery, force machines, capable of coming to realistic grips with their machinery. A vehicle propelled via an OD field is capable of accelerations which would be destructive to the crew except for the fact that immersion in an OD field imparts an inertial connectivity such that the vehicle and its contents are propelled as a whole. The crew of such a machine would not experience the sensation of acceleration associated with machines in which only the structure of the vehicle is accelerated, i.e. jet aircraft or rocket propulsion. As well, electrical machinery will not function properly in the environment of intense OD fields so that our (primitive) mastery of such technology may serve us in ways that are not readily apparent until more experiments are performed. A race of parasites operating just two jumps ahead of the law is not one in which research and scientific development are primary concerns, if at all. We can expect these interlopers are here for one purpose only, and that is to satisfy a compelling need for a natural product which they themselves are incapable of satisfying. The clandestine and contemptuous lack of respect for a species toward which their depredations are directed only speaks of an immorality which is supported only out of lack of a normal healthy substrate for living. Further analyses are possible, but at this juncture more detailed behavioral inferences would detract from the apprehension and rationalization of the data already presented. # Plans for the Future: The simple experiment of dropping the spinning ball and ascertaining the reality of a fundamental experiment in the interaction of rotation, inertia, and gravity, will provide the focus for the development of a new basis for society. Man’s entrance into space will be sparked by the mastery of the principle of variable inertia. The experiments suggested here may be easily verified by the concerned experimenter with elementary equipment. Experimental writeups of the work which has been done at this laboratory are available by writing to this author. All assistance will be furnished to those who will duplicate the basic experiments and convey the results to those agencies who have the power of action. In the years I and my students have been prosecuting this work we have compiled a list of those individuals and their respective institutions who have consistently rejected my experimental findings. No better service to the common enemy could be done than by these men who refuse to acknowledge new discoveries in the chauvinistic determination to protect their respective positions and uphold their reputations and those of their supporters. # Friends and Enemies: Dear friends, those of you who have been involved in the gathering of evidence to support “new phenomena” have time and time again come up against “expert opinion” which trenchantly resists the notion that there is anything new, much less a deadly threat. At all costs we must avoid a panic. Those of you who have attended scientific Universities are familiar with the way in which scientific material is presented by the “experts.” We tend to laugh at the students who are the “grinds”, who memorize the material by rote and regurgitate it for the exams. What lends a more sinister note is that these “grinds” are usually the ones who linger through graduate degrees and post doctoral fellowships and finally sit on that much sought after chair. Having attained the priceless gift of tenure they sit until called to act on that panel which is convened to examine “the evidence.” Most of these people have never done an experiment in their lives. When faced with facts or information which cannot be fitted into an interpretation of the dogma on which they base their careers we hear the familiar: — “I do not understand it at all”, “totally unconvincing”, “none of our reviewers has been able to see any merit in your papers”. These quotations are taken from the utterances of Dr. S. A. Goudsmit, Editor-in-Chief of the Physical Review. More on this later. In the development of the ideas which are the greatest physical discoveries of the 20th century and which represent the breakthrough into the new physics and mathematics which will extricate us from the present crises of power and energy, I have had to learn by direct experience who are the people who are to be avoided if new scientific progress is to be made. Of course through all this there are many friends too. I speak here of my students and friends who have been supporting me from the time I left my associations at Harvard and MIT to pursue these researches. My advice to those who wish to follow the path to new knowledge is that if an individual cannot apprehend the new information immediately, it is fruitless to think he will be able to think it over and later decide what you have to say is correct. Truth has a ring to it which is unmistakable to those in search of it. Early in the game I discovered it was a mistake to wait for a reply from those to whom I sent the results of my experiments. To force the issue I and my students made visits to some of the “great minds” to confront them with the evidence in their offices. At this point I would like to point out that the discovery of variable inertia has been preceded by some work in which the investigators knew they were on to something new but were unable to consummate their work because they were unable to assemble a thorough enough understanding of the phenomena to come to the conclusion of so basic a phenomena as the variability of inertia, the refutation of Einstein, and the complete overthrow of the dogma which presently paralyzes the thinking of our scientific establishment. I speak here of the pioneering work of Norman L. Dean of Washington, D.C. who demonstrated and patented a prototype machine for the conversion of rotary motion into unidirectional motion. U.S. Patent 2,886,976 filed July 13, 1956. John W. Campbell of then Astounding Science Fiction magazine inspected the prototype and wrote an article: “The Space Drive Problem”, which appeared in ASF for June 1960. Campbell inspected and documented the operation of the machine which then was able to generate a unidirectional force of about 18 lbs. from the output of a 1/4 Hp. electric drill motor. Dean’s machine was never able to “lift off” because, although he did not realize it at the time, his machine required an inertia load which was lost as soon as the machine lost contact with the ground. The best he could achieve was zero weight. The demonstration of the Dean machine to many of the constituted governmental agencies and scientific “authorities” elicited no support and much ridicule. Experts were called in to “mathematically prove” the machine could not possibly work. Interest in “non-linearities” in Newton’s Laws of Motion sparked investigations by Dr. William 0. Davis which appeared as another article in ASF May 1962, “The Fourth Law of Motion.” Davis was trying to understand what he called “rate” effects in the application of accelerative forces to real material objects. He was the first to call attention to the fact that it mattered how fast acceleration was applied to a real physical object. At high rates of “surge” (dA/dt) forces were generated which were destructive to the object under test and which seemed to be much greater than those predicted by the simple application of F = MA. He tried to develop alternative modifications of this basic expression to explain the forces he was measuring but since his development was not supported by more basic understanding of matter and motion it was not pursued further. # Additional Laws of Motion was run again in the Dayton Daily News in spring 1974 when it was brought to my attention by a connection I had in Detroit to whom Wolfe had sent a proposal for the development of new propulsive machinery. Wolfe and I have been associated since that time. His mathematical development is too abstruse to be presented here but it represents the substrate into which the principle of variable inertia can be mathematically described. I call your attention to all this because the main difficulty in the acceptance of the idea of variable inertia is the fact that this physical entity cannot be described by present mathematical systems without the inclusion of the additional postulate of non-infinite divisibility of mathematical representations of physical entities. This very basic idea can be illustrated by the concept of the weight of an object, say so many pounds for the weight of a particular object. If the number which represents the weight of an object is subject to division we have to include the fact that when we divide a real physical object into smaller and smaller portions we eventually reach a point of the last atom wherein further division destroys the identity of the material. A mathematical representation of a real physical quantity must include the property of non-infinite divisibility in order to properly represent the real physical property of the object or entity under consideration. The simplest ideas generally require the most lengthy exposition. I must defer further discussion of these ideas to more specific papers which are available from these Authors. My point is now a framework exists for a more general description of physical phenomena than now represented by the obsolete representations of Newton and Einstein. – Mr. George M. Rideout, Gravity Research Foundation. Four papers submitted, no response. I have suggested to these gentlemen that they formulate their retirement plans. Evidently it takes a giant to remove a worm.